What does this have to do with participation? Basically, participation is where the data come from. A basic function of these participatory technologies is to build huge sets of correlations between objects. Google uses our inputs to identify the most useful searches, but it can also help identify flu outbreaks. That’s a crude example, heaven knows what else. Data about purchases from “rewards clubs” do more than target coupons to you; at least, it seems that they should allow companies to identify consumption trends, manage inventory, target what products are likely to succeed in the future. What can be done with the rich network and taste data in Facebook or the health data in Google Health or PatientsLikeMe? Since the 1960s “participation” has become a powerful political discourse and source of institutional legitimacy. Chris and others are working on this genealogy. Participation, from the Port Huron Statement to Total Quality Management, was conceived as a solution to problems of democracy, bureaucracy, management, efficiency, and so forth. But participation was always more than a technical solution that delivers better “results”. It is also a moral discourse that evokes individual capacities and power, but in a communal, civic, responsible mode—not simply the empowerment and unfettering of the self-interested actor. Indeed the “participant” is something of the cooperative, altruistic counterpart to the purely selfish rational actor. 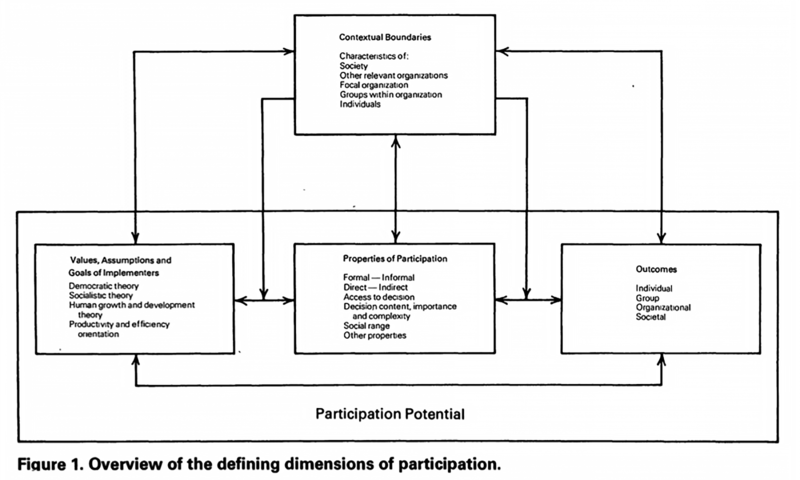 This means that “participation” has a strong normative and ideological force. Today governments, corporations, non profits, all gain authority by introducing participatory processes into their projects. In biomedicine, for example, these range from comment processes and periods in regulatory decisions; bioethics, IRB, and community consultation panels that include non-expert, “community” members; the NIH even offers grants to patient advocacy organizations to foster their participation. The cultivation of participation is crucial to these institutions’ legitimacy. Thus the meaning of participation is changing, and to think of it only in terms of the problem of cracking open closed and powerful institutions and making them more publicly accountable misses the ways that participation has become a stake in broader political struggle with many actors fighting to define it to their advantage. The ironic twist here is that participation is fueling the intellectual apparatus (i.e., the correlational knowledge of behavioral patterns) of what may be a new paradigm of governance that is deeply technocratic and non-participatory. The vision of the governance paradigm that Davies sketches isn’t one where decisions are made openly in partnership with human subjects conceived as political stakeholders whose will and investment in decisions must be respected. Rather it is one where human subjects are complex and irrational whose behavior (and happiness) must be managed and optimized. Part of the task of our lab should be to think of participation as something analogous to the population in Foucault’s famous analysis of biopolitics and governmentality. What happens when “participation” becomes an object of knowledge and manipulation, public and private power, pastoral authority, (even ethical self care)? Previous PostPrevious ‘All Books Are Participatory’: Interview with Adam Hyde at FLOSS Manuals.